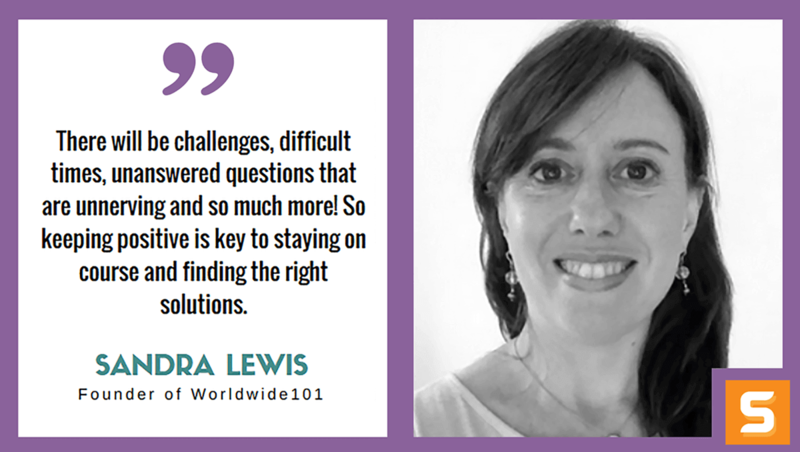 Sandra Lewis is the founder of Worldwide101, a premium virtual assistant company connecting demanding founders and executives with highly skilled, meticulously matched help. As Founder and CEO, Sandra is a driving force behind their relentless push for client satisfaction and screening for top talent. She's passionate about Worldwide101's culture of caring and making sure that clients and assistants have a great experience working within their brand. In this Startup Savant interview, Sandra shares with us her awesome entrepreneurial story about helping/assisting entrepreneurs and business owners with their needs in the 'human realm.' Sandra also talks about identifying people who truly care about your business and also the traits she thinks every entrepreneur should have in order to succeed. Enjoy! What made you start Worldwide101 and make significant changes in the industry? Back in 2009, my husband and I moved our family from the US to the UK and so with it, came a change in my career. After working a very intense and consuming job for 22+ years in NYC, I wanted to find a way to continue to have a rewarding career without the stress of a commute, office politics and an all-around exhausting experience! At the time, freelance was on the rise so I decided to give it a try. I started helping a few entrepreneurs on a virtual and contractual basis with HR consultancy and project management and soon my clients started referring their friends for my services. I soon started noticing how hard it was for successful business owners and entrepreneurs to find and train skilled and reliable talent who would work on a flexible basis without breaking the bank. I set myself to provide a durable solution and that’s how Worldwide101 was born! How do you find people that truly care about your business? Our team is what makes Worldwide101, so identifying people who truly care about your business is a topic very close to my heart! Everyone has different interests in what they like to do, what they're good at, and in what they're passionate about. At Worldwide101, we look for professionals who are passionate about service, and who love to make a difference in someone’s day. Of course, our team is also skilled in their field of expertise; whether that’s marketing, social media, bookkeeping or executive assistance, However, attitude and a true desire to make our clients successful and look good - is what trumps it all, and what's made our company the #1 choice as a premium virtual assistant company for hundreds of demanding business owners. So to answer your question, to find people that truly care about your business, figure out your business values and then look for people who are not only share these values, but are really passionate about them. For us, one of our core values is to be friendly and caring so we look for professionals who have an innate sense of what friendly and caring truly means! How did you get Worldwide101 off the ground? Did you bootstrap, pitch with local accelerators or VCs? We bootstrapped our business from day one, and I'm so happy we did! A key aspect of what made that possible is choosing a recurring revenue model so that cashflow was always positive. Worldwide101 provides talent and professionals to successful business owners, organizations, and entrepreneurs and we take great care to match professionals with our clients based on their skills, availability and also interests. So we're not in the tech realm but in the very “human” realm. And for this reason, the reputation of our company and the ability to maintain the quality of our services has only been possible because we scaled at a manageable rate. What would you say the top 3 skills/traits needed to be a successful entrepreneur? I'm a big believer in keeping a positive outlook as the #1 trait that makes any entrepreneur successful. There will be challenges, difficult times, unanswered questions that are unnerving and so much more - so, keeping positive is key to staying on course, and finding the right solutions. I wrote a piece on Medium last month titled, "Two Words That Make You A Better Founder" about how I wasn’t always good at staying positive but found ways to develop that over time - perhaps others will find it helpful! Keen attention to detail. To build something big you need to start with something small. Know your limitations. You can’t do it alone so by knowing what you don’t know, you can assemble a great team! Just last month, Worldwide101 was honored to be recognized as one of the “Best Entrepreneurial Companies in America” by Entrepreneur Magazine’s Entrepreneur 360™ List, the most comprehensive analysis of private companies in America. That was pretty epic and we couldn’t be more proud! How do you build a successful customer base? Do you have any Epic Marketing tools? I'm not going to be super-original here! We've focused all of our energy on building a premium brand and providing outstanding services for our clients on a consistent basis. The result is that our clients love us, stay with us for years, and refer their friends and colleagues. If I had one recommendation for every founder out there it would be to focus on delivering a genuinely outstanding service and experience for your clients - because the rest follows. Who or what Most inspires and shapes Worldwide101? I'm inspired by the clients, businesses and organizations that we support. Many of them have started their platforms from the ground up and we're very proud and feel lucky to accompany them on their journey. What is the biggest mistake you’ve made while running Worldwide101? I've made a few hiring mistakes along the way. A couple of years ago, we hired someone who disappeared on us just after 2 weeks of working with our clients. I had to scramble to find replacements, and I offered our services for free for a month as an apology for the terrible inconvenience. We've refined our hiring process so much since then! Do you think it’s important for an entrepreneur to have hobbies other than work? Yes, I think it’s important to have a hobby but - it’s hard to find the time!! I find my solace in walking my 3 big adventurous dogs on long countryside walks. It’s my ‘me time', and I love watching them play - it always makes me laugh! So I guess my hobby is to watch my dogs play! What advice would you give to entrepreneurs starting a business in New York? Start with market research. I think a lot of people get an idea and run with it - which is very courageous but perhaps a little dangerous! Talk to people, try out the concept, take baby steps and then launch once you know there's demand. The demand doesn’t have to be huge - but there has to be some interest to make it a valid idea.